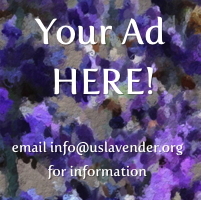 The United States Lavender Growers Association is a membership based organization with three membership categories. You can join in the category that best fits your interests and needs. If you have questions, you can Contact Us. One Member. No voting rights. Available to all lavender enthusiasts and students not meeting the Grower or Affiliate member categories. Friends have an overall interest and enjoyment of lavender without the intention of becoming a lavender grower or create and sell value-added lavender products from their own crop. The USLGA created the Reciprocal Affiliate Membership category to partner with Lavender Associations outside of the United States and its’ Territories. One Member. No Voting Rights, No Dues. This category is an arrangement without exchanging dues between associations whose interests are compatible with those of the United States Lavender industry and USLGA. It is designed to exchange information and build mutually beneficial relationships. If your association is interested, please contact us! Each Membership has one vote. Membership is held in the name of the individual member. In the event ownership is a vested entity of LLC, Corporation, Partnership, etc, you may name one additional individual/officer as part of your membership. One of the named individuals/officers must be designated as the voting member. The assigned username and password, Member's Area of the uslavender.org website, and associated USLGA benefits are only for the designated persons use and not to be distributed to non-members. This membership is for one individual and is designed for multiple growers within one business entity or family and staff who need their own membership. It is connected to a Grower Member who is the master grower in this arrangement and must be approved before membership is completed. Membership is for one individual/officer of a company or corporation, or an association or organization as a whole. This membership level has no voting rights. Associations and organizations are permitted to post their organization's events and meetings on the Calendar of Events. Individual members of associations and organizations are not allowed to post their events unless they hold individual memberships. The assigned username and password, Member's Area of the uslavender.org website, and associated USLGA benefits are only for the designated persons use and not to be distributed to their organizations members. The designated member is the voice for their organization and should use the information on the site properly. Information should not be downloaded or forwarded. The designated contact can post on the forum, post events, read the member newsletter. Membership is non-transferable upon the sale of the business. Reciprocal members will have their organization name and website listed in the member directory, organization events and meetings listed in the Event Calendar, and access to the USLGA logo for usage on their website. They will also receive our in-depth newsletter, a discount at the National Conference, and access to our website covering all aspects of our industry. Membership dues will be due and payable upon receipt of application for membership. The amount of the annual dues may change from year to year. Annual dues are payable each year on or before the date of original membership. There is a 30-day cancellation policy for new members. Should notification be received from the member within the 30 day period from signing up, they will receive a full refund. After the 30 days, there is no refund. Charter Membership was obtained by joining the United States Lavender Growers Association by October 27, 2012. This title is only for grower or associate members and would entitle them to use this terminology in their advertising materials, as well as their websites. It would remain in effect as long as the member remains in good standing with paid-in-full dues and exercises their right to vote. Membership is non-transferrable upon the sale of the business. A majority of Board of Director positions will be filled by grower members. The remaining positions can be filled by either grower members or associate members. Any member not having a primary address in the United States, and affiliate members, are not eligible to be on the board of directors; however, they may be appointed to committees. If you have any questions concerning membership, please contact us.